"Loving You" released in 1957 was Elvis' second movie, and his first in color. Do you know when Elvis first dyed his hair black? Why did Elvis have a cat named 'Wendell'? Why were the 'clapping twins' featured? Where did the Presleys stay in Hollywood? What was Deke Rivers' real name? Was 'Kissin' Cousins' really used for Elvis back in 1957? EIN presents all you need to know and more about 'Loving You' . . .
"Loving You" released in 1957 was Elvis' second movie and his first in color. In 1956 Producer Hal Wallis bought the film rights to a story written by Margaret Agnes Thompson. It had appeared in the June 1956 issue of "Good Housekeeping" magazine and was a story set in Oklahoma about a young singer called Lonesome Harris and his journey to stardom. Hal Wallis thought it would be a perfect vehicle for Elvis. The working title was "Lonesome Cowboy". It then became "Running Wild". Finally, "Loving You", the name of a song Leiber and Stoller wrote for Elvis for the movie, became the title. Hal Wallis assigned Hal Kanter as the screenwriter and director for the movie. At the time, Kanter, a native of Savannah, Georgia, was 37 years old. He had written for variety shows, graduating to screenplays and specializing in comedies. He wrote for Bob Hope as well as the comedy team of Dean Martin and Jerry Lewis. For the movie "Loving You", Wallis wanted Kanter to visit with Elvis and to get to know him off the movie set and as a live performer. So, on December 12, 1956 he flew to Memphis to meet the young star. On the first day, Elvis showed him around his Audubon Drive home, where Kanter enjoyed a meal of fried chicken with the Presley family. After a tour of Memphis on the 14th they drove to Shreveport, Louisiana, stopping in Pine Bluff, Arkansas for dinner with entertainer friends of Elvis', Jim Ed Brown and Maxine Brown. Once in Louisiana Kanter saw first-hand an audience's hysterical reaction to Elvis in concert. He also noted a set of twins in the audience clapping to the music, one twin clapping her right hand to her sister's left. He made a mental note to include this small nuance in his script for "Loving You". Over the years Hal Kanter received six Emmy Award nominations, winning the last two for his writing on the annual Academy Awards telecast. He also wrote the script for Presley's 1961 hit film "Blue Hawaii", which garnered him a "Best Written American Musical" nomination from the Writers Guild of America. In "Loving You" the twins used for the hand-clap scene were Trude and Maida Severen. This was Trude's only film, but Maida continued acting, having roles in such movies as "Imitation of Life" and "Airport 1975". Her television work included a recurring role on "General Hospital" and guest roles on "The Addams Family", "Gidget", "Bewitched" and "Starsky & Hutch". The executive producer for "Loving You" was Paul Nathan, who had worked on films such as "The Rainmaker" and "Gunfight At The O.K. Corral". Nathan worked as associate producer on eight other Elvis films: "King Creole", "GI Blues", "Blue Hawaii", "Girls! Girls! Girls! ", "Fun In Acapulco", "Roustabout", "Paradise, Hawaiian Style", and "Easy Come, Easy Go". Hal Pereira was the art director. His set designs can be seen in over 250 productions, including the Elvis films mentioned above. He received twenty-three Academy Award nominations for his work in such films, including "Sabrina", "The Ten Commandments", "Funny Face", "Vertigo", and "Breakfast at Tiffany's". He won the Academy Award for his work in "The Rose Tattoo". Musical director for "Loving You" was Walter Scharf. He also worked on Elvis's 1958 film "King Creole" and the 1981 documentary "This Is Elvis". Scharf received a Golden Globe award for the song "Ben" from the movie of the same name. Among his career achievements were ten Academy Award nominations. Elvis enjoyed working with choreographer Charles O'Curran, who was married to popular singer Patti Page at the time. O'Curran hung out with Elvis and his band off the set, often inviting them to his home. He staged musical numbers for five more Elvis films: "King Creole", "GI Blues", "Blue Hawaii", "Girls! Girls! Girls!" and "Fun In Acapulco". Legendary movie costume designer Edith Head was the lead designer for this film. Probably the most notable costume in the film is the famous red and white cowboy suit worn when Deke sings "Teddy Bear". "Loving You" is one of the nine Elvis films that she worked on. Elvis left Memphis by train for Hollywood on January 10, 1957. After recording sessions he reported on the 14th to the Paramount makeup and wardrobe departments for his new role as singer Deke Rivers. Wally Westmore had charge of makeup for "Loving You", as he did for all of Elvis' Paramount films. It was on January 14, 1957 that Elvis first had his natural light brown hair dyed black. He had decided it would look good on film, as did the dark hair of Tony Curtis, one of the actors he admired. He let his hair go back to its natural color while serving in the U.S. Army, 1958-60. But for that and a brief time in the early 1960s, Elvis kept his hair dyed black for the rest of his life. Lizabeth Scott played Deke Rivers' manager, Glenda Markle, who was a essentially a female version of Elvis' real-life career manager, Colonel Parker, the supreme promoter. Lizabeth Scott, a sultry blonde with a husky voice, was discovered by Hal Wallis in 1945 and was often compared with actress Lauren Bacall. She appeared in many films between 1945 and 1957, most of them for her mentor Mr. Wallis and Paramount. Among her film credits are: "You Came Along", "Dead Reckoning", "Desert Fury", and "I Walk Alone". Except for a role in 1972's "Pulp", "Loving You" was her last film. Ms. Scott is generally regarded as one of the queens of the "film noir" genre of movies. Among her honors is a star on the Hollywood Walk of Fame. Wendell Corey played Walter (Tex) Warner, the leader of the band that Deke joins. Mr. Corey, son of a minister, was born in Massachusetts in 1914. He was a stage actor in the 1930's and 40's until he signed with Hal Wallis in 1946. "Loving You" reunited him with Lizabeth Scott, with whom he had worked in "Desert Fury" and "I Walk Alone". During his career, Corey served stints as president of the Academy of Motion Picture Arts and Sciences and president of the Screen Actors Guild. He served on the Santa Monica California City Council in 1965. He was defeated in 1966 in his run for the House of Representatives. 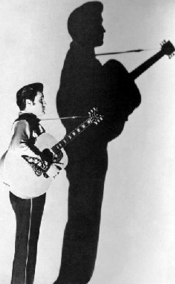 Elvis once named a pet cat Wendell in his honor. Dolores Hart played Deke Rivers' love interest Susan Jessup. Ms. Hart was born Dolores Hicks in Chicago in 1938. Coincidentally her uncle was Mario Lanza a singer Elvis admired. 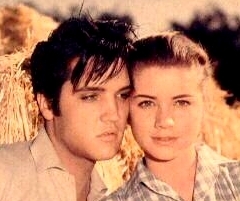 Hart worked with Elvis a second time when she co-starred with him in "King Creole" in 1958. Among her other credits are the films "Where the Boys Are", "Francis of Assisi", "Sail A Crooked Ship", and "Come Fly With Me". She decided to become a nun and, in the 1960s, walked away from a successful and promising acting career before it had peaked. She is now Mother Dolores, but is still a voting member of the Academy of Motion Picture Arts and Sciences. Left: Elvis in 'Mean Woman Blues' action. Jana Lund has the distinction of being the first actress to share an on-screen kiss with Elvis. Her character Daisy Bricker stole that kiss when she snuck into Deke Rivers' dressing room on a dare. (Dolores Hart, later in the same film, shares the first on-screen kiss initiated by an Elvis character.) Ms. Lund's character is also the catalyst for the big fight scene between her boyfriend Wayne and Deke. Lund also had roles in the films "High School Hellcats", "Hot Car Girl", and "Married Too Young". The character of Wayne, who loses the fight in the diner, was played by Kenneth Becker. Mr. Becker can also be seen in the Elvis films "G. I. Blues", "Girls! Girls! Girls!" and "Roustabout". Mr. Becker also had a number of guest roles on TV western series such as "Gunsmoke", "Bonanza", and "Wanted Dead or Alive". Paul Smith played Skeeter, the band mate who loans Deke his guitar. In the film Deke always breaks the strings on Skeeter's guitar until Deke's growing importance with the group prompts bandleader Tex to buy Deke a guitar of his own. (That bit in the script was an inside joke that writer Hal Kanter picked up on as Elvis actually did often break his guitar strings.) Among Paul Smith's film credits are "Cowboy Blues", "The Westward Trail", "All That Heaven Allows", and "Funny Face". Booking agent Carl Meade was played by James Gleason, who was born into a New York theater family in 1882. After serving in the Spanish-American War, he joined the stock theater company that his parents were running in Oakland. He and his wife toured in road shows until he enlisted during World War I. When he returned to the stage after the war, he tried his hand at writing and producing and then focused on being a character actor. Mr. Gleason appeared in over 125 movies. He received an Academy Award nomination in 1942 as Best Supporting Actor for the 1941 movie "Here Comes Mr. Jordan". Ralph Dumke, another well-known character actor, played Jim Tallman. He had a recurring role as Mr. McAfee in "The George Burns and Gracie Allen Show" on television. His movie credits include "All The King's Men", "Daddy Long Legs", "Wake Me When It's Over", and Elmer Gantry". Charles Lang was the cinematographer for "Loving You". In 1961 he also filmed the lush scenery seen in Elvis's movie "Blue Hawaii". Mr. Lang received 18 Academy Award nominations for his work in such films, including "Butterflies Are Free", "How The West Was Won", "Some Like it Hot" and "Sabrina". He won for the movie "Farewell to Arms". Joan Bradshaw had an uncredited bit part in "Loving You" and several other movies in 1957. She went on to become a producer on such films as "Mrs. Doubtfire", "Cast Away", and "Road To Perdition". As in many Elvis movies, the cast of "Loving You" included a number of veteran character actors, including Joe Gray, Irene Tedrow, William Forrest, Madge Blake and Skip Young. Joe Gray, a former boxer, was a fight coordinator and a longtime film double for Dean Martin. Among his credits are the Elvis movies "Loving You", "GI Blues" "and "Kid Galahad". Other credits include "Rio Bravo", "Ocean's Eleven", "Breakfast At Tiffiany's", "Robin And the Seven Hoods", and "Bye Bye Birdie". Irene Tedrow played Mrs. Jessup. Among her hundreds of roles in film and television, two earned her Emmy Award nominations - one for the TV show "James at 15" and another for the TV mini-series "Eleanor and Franklin". William Forrest played Mr. Jessup. He too had hundreds of roles, including one in the Elvis film "Jailhouse Rock". Madge Blak played a hired crowed agitator in "Loving You". She is perhaps best recognized for her TV roles as Aunt Harriett Cooper on "Batman" and as Larry Mondello's mother in "Leave It To Beaver". You also might recognize Skip Young, who played Teddy, a friend and co-worker of Deke Rivers (Elvis) in the opening scenes of "Loving You". Mr. Young was a regular on the TV series "The Adventures of Ozzie and Harriet" in which he played a buddy of Rick Nelson's. Yvonne Lime played Sally in "Loving You". She also briefly dated Elvis and visited him in Memphis for Easter in April 1957. At the time Elvis and his family were renovating Graceland and had not yet moved in. Elvis brought her out to see his new home. Ms. Lime previously had a long-time role as Dotty on the TV series "Father Knows Best". She continued to act after "Loving You" until her marriage to TV producer Don Federson, when she turned her energies to children's charities. She and fellow actress Sara O'Meara founded International Orphans Inc., building orphanages in Japan and Vietnam, as well as starting Childhelp USA for abused and neglected children in the U.S.
Elvis' parents Vernon and Gladys and their friends Carl and Willy Nichols came to Hollywood for a month of vacation and to see where their son worked. Vernon & Gladys Presley & their friends spent time sightseeing and both ladies bought pet poodles. Mrs. Nichols named her poodle Pierre and Mrs. Presley named hers Duke after John Wayne. Scotty Moore and his wife Bobbie took the Presleys to see the filming of the Tennessee Ernie Ford weekly TV show. They were introduced from the audience and went back stage to meet Mr. Ford. Elvis and his date Joan Blackman took them to see the movie "The Ten Commandments". (Blackman was Elvis's leading lady in "Blue Hawaii" a few years later in 1961 and then again in 1962's "Kid Galahad".) Vernon and Gladys also visited Elvis on the set of "Loving You". It was on a visit to the studio that Hal Kanter got the idea to include them as extras in the Grand Theatre audience. They can be seen sitting on the aisle with Mr. and Mrs. Nichols next to them. The Presleys clapped with the music and applauded proudly for their son. It is said that after his mother's death the following year, Elvis couldn't bring himself to watch "Loving You". "Loving You" premiered in Memphis on July 10, 1957 at the Strand Theater. Elvis didn't go to that showing. Instead, he took his date Anita Wood and his parents to a private midnight screening. The film opened nationally on July 30, 1957 and peaked at #7 on the Variety National Box Office Survey. * Elvis and his family stayed at the famous Hollywood Knickerbocker Hotel. * ‘Loving You’ was re-released in 1959, while Elvis was in the army, as a double-bill with ‘King Creole’. * Deke River’s "real name" was ‘Jimmy Tompkins’. As an orphan he ran away by chance coming across a tombstone that read, "R.I.P., Deke Rivers, 1878-1934. He was alone but for his friends who miss him." He decided to assume this for his new name. * Making their screen debuts in ‘Loving You’ were Scotty Moore, Bill Black, D.J Fontana, The Jordanaires, as well as Elvis’ parents. * The amount punched up by the cashier in error at the end of the ‘Mean Woman Blues’ fight scene was $95.00. * Dolores Hart sings the song ‘Detour’ in the movie. ‘Detour’ was a #12 chart hit in 1951 for Patti Page. She was married to film choreographer Charles O’Curran. * In an extraordinary coincidence, the newspaper headline on the shock photo of Deke Rivers being kissed by Daisy Bricker was "That’s Kissin’, Cousins". * The Amarillo Theatre where the band performed was called ‘The Grand Theatre’. The movie showing was ‘The Sad Sack’ starring Jerry Lewis. * Deke River’s band-mate Skeeter’s parrot was named ‘Matilda’. Below: The Spanish Film Poster for 'Loving You' - "The Woman That I Love"
Facts, Photos & Trivia by Piers Beagley/EPE; copyright EIN/EPE - June 2006. Click here for the essential FTD 'Loving You' deluxe CD review. Click here for 'Inside Loving You' Book Review & images.